This cool 8×10 photo was originally given as part of the press-kit that the press received for each new model year. The detail you can see in these fine prints is amazing, obviously printed from professional large format film negatives. I’ve scanned this image and the attached description sheet at high resolution for your enjoyment. Click on the image to view the description page, then click the link above for the full 2048x resolution scan. I’ve got two more similar photos from 1959 that I will post at a later date. 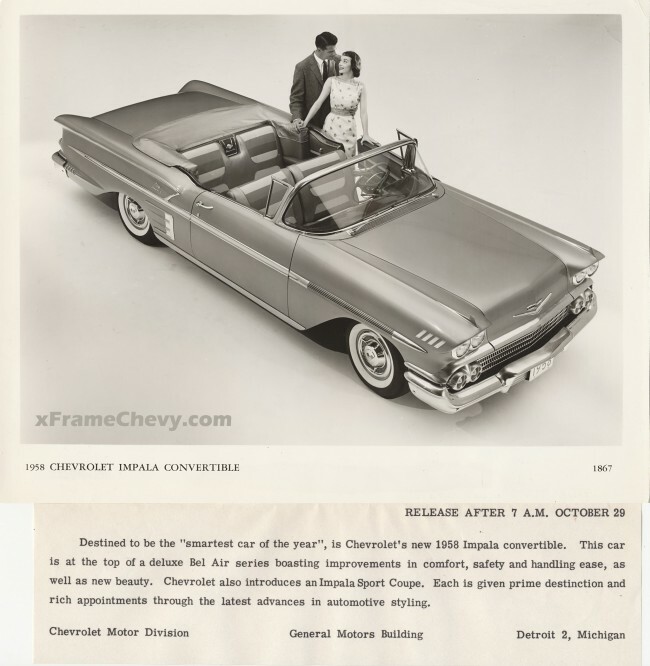 Destined to be the “smartest car of the year”, is Chevrolet’s new 1958 Impala Convertible. This car is at the top of a deluxe Bel Air series boasting improvements in comfort, safety and handling ease, as well as new beauty. Chevrolet also introduces an Impala Sport Coupe. Each is given prime destinction (sic) and rich appointments through the latest advances in automotive styling.